It is amazing what you get round to over the holidays when the wind starts blowing, and telecommunications stop working. A couple of months ago I had the pleasure of representing the OU in Scotland at the Scottish Rural Parliament. I am a rural resident myself and the event was half professional half personal – maybe even three-quarters personal. I thought I ought to earn my place by running a fringe workshop. 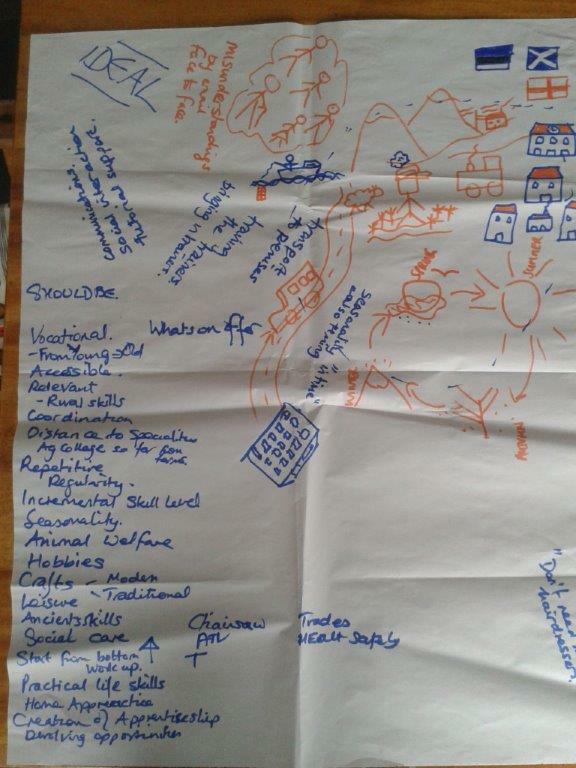 Since its first meeting at the SCVO ‘Gathering’ in 2014 I have been following the development of the Parliament, and also following the absent presence of education narratives within the big rural themes identified by the group. Clearly others had felt the same as the fringe events had a number of education events, and in the Open Space where people could suggest topics, the education ones were very busy. education issue and the narrative is dominated by pupil numbers, recruiting teachers, ensuring rural pupils receive an equivalent experience and teacher CPD. These big issues are the responsibility of the local education authority. However, in dealing with issues of geography, demographics and equivalent experience, it is easy to neglect more fundamental questions like, ‘what does an education system that supports the development of sustainable rural communities look like?’ It was this question that formed the basis of the workshop I ran at the Parliament. I had 18 people in the room, which I was pleased with, and I started off with an anecdote. A decade or so ago I was at a Rural Development conference listening to a paper by a Canadian academic Mike Corbett on rural education. He asked us, ‘who thinks of themselves as a rural academic’, some hands; ‘who grew up in a rural area’, some hands, though not the same ones. Then, ‘who was told if they do not work hard they will be stuck in this place for the rest of their lives’, hands and some wry smiles, ‘Who still lives in that place’, two hands, my own and the speaker’s hand. He then went on to describe the education system as grease in the barrel of a gun (I know, a real North American metaphor). Its measure of success is people leaving those communities. Of course it is clear that many feel there is nothing to stay for, and if we think about an education system that offers people the possibility to stay we must also address the question of what will they do if they stay. In order to develop these interlinked issues I asked people to consider the question, ‘what does an education system that supports the development of sustainable rural communities look like?’ I asked them to consider it “in an ideal world”, to forget the barriers, all the things stopping it; what would the ideal education system be to enable thriving rural communities. I asked them to capture their thoughts in a “Rich Picture”. I had thought that perhaps this soft systems method might be a wee bit of a difficult sell; after all it is coloured pens and paper. It was not. What was a hard sell was thinking of an education system in an ideal world. As I went round the tables people kept saying “we could have that, but no…”, “it wouldn’t work because … “, or “if only we had this we could do …”, and then people talked and rehearsed all the factors that were stopping those things. It became about the barriers and the consequences of those barriers. When I asked people to set those aside, to think about a vision without the barriers they got annoyed, upset even. We did get past this, but it was interesting to reflect, when we spend our lives dealing with the conditions and consequences, how difficult it can be to think about a future not constrained by those barriers. So what did we find out? I include a couple of the images here, but of course it is not just the pictures but also what people say about the pictures that matters. The key themes that came out were around freedom and mobility. By freedom, people meant being able to have a choice about the set of skills or subject, the level, and the mode of study. In many ways that sounds a bit like the ‘death of space’ push of much rural policy – of equivalence of experience; actually it was subtly different. Partly it related to the kinds of choices people talked about, for example skills and subject that might enable the freedom to remain in or move to a rural area. However, the critical element, what enabled those freedoms, was the centre of gravity shifting to rural areas, about decentralisation, about rural areas having the freedom to create the curriculum they need; to develop and grow it through connections and a distributed network, and decentralised expertise. On top of this was the idea that it was okay to stay in a rural area, it was okay to leave, and it was okay also to come back. From this participants developed a narrative about mobility, about an education system that allowed people to be mobile, but also that there was mobility between skills/subject, location and mode of study, and level. For those in the education sector it sounds deceptively like the ideas of virtual mobility that arose through the Bologna Process. However, they approached it from what mobility enables for rural communities, choice depends on those mobilities, and is enabled by them. The second area was part of this as well. It was about the subjects and skills, the level and the balance of informal/non formal/formal interfaces, and where expertise lies. Indeed the last one seemed to be the one that people drew on; the sense that expertise about the needs of rural communities resides in rural communities. An education system that enabled sustainable rural communities would value informal and non-formal learning, within the community, with a currency that was recognised more widely. The latter was not an argument for accrediting the in/non-formal, but for a broader recognition that this kind of learning is important. They are important for the rural economy, in particular in land-based areas, but also in the increasingly important Third or Community sector. Important because through these networks people learn in, for and through doing; people were able to provide examples like how to sharpen a chainsaw, an aspect of being self-employed, or running a community cinema, or building a community hydro. Very diverse skills, but important ones for sustainable rural communities, and people talked about this sharing communities and groups, and between individuals within different sectors of the community and different generations as the “social glue” that binds them. This was happening now, it had value and was valued in rural communities, but perhaps the fact it hides in plain sight meant it was in danger of being overlooked. The teams suggested, what an education system for sustainable rural communities would enable is recognition of those skills and that knowledge more broadly, a recognition woven back into issues around mobility and choice. I mentioned earlier the lack of education among the big themes of the conference. However, it did emerge as key through the Open Space approach where participants created their own sessions. 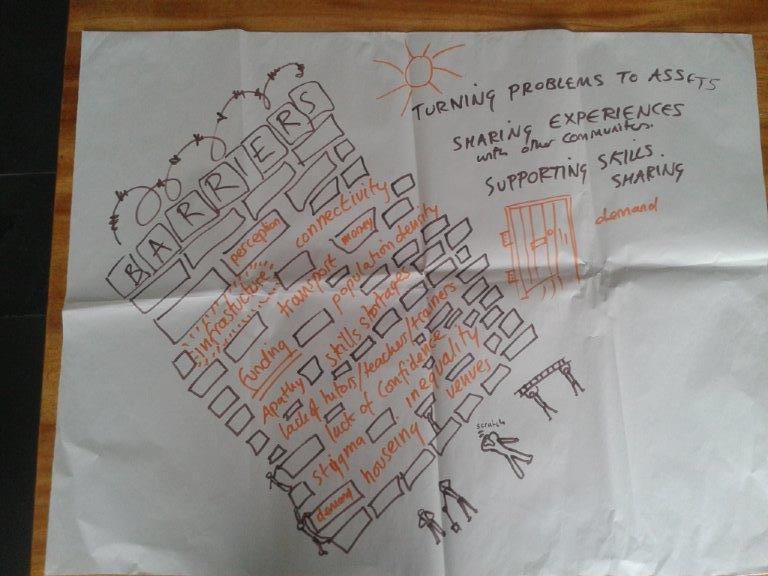 One of the undercurrents of the workshops I ran was around personal and community autonomy, the sense of being able to identify and solve our own problems – about hard work and creativity. In these later sessions people spoke a lot about the need to recognise rural people as being enterprising, and for rural residents to recognise and own the idea they are entrepreneurs. I suppose I should now hesitantly put my hand up and mention an OER on Rural Entrepreneurship in Scotland created by the OU in Scotland, a practical step-by-step guide to help individuals and communities put their ideas into practice. I am hesitant because, like a lot of people, from outside, the language of enterprise can make people uneasy, It smacks of “get on your bike”, and arguments that shadow the social capital/social inclusion debates which treat problems as social often individualising them, and by seeing solutions as coming from being more enterprising obscure the underlying structural inequalities. However, it was interesting to hear participants talk about enterprise and innovation, especially in relation to the fraught question that shadows my own thoughts: okay, we encourage people to stay, but stay to do what? It seemed to be about claiming the language of enterprise, in particular at a community level; it was about how rural communities can collectively address the challenge of creating meaningful employment, reasons to come and reasons to stay. It was very refreshing and reminded me of my own wistful contribution on School Education* I made to the Open Education 2030 series of workshops, where I imagined a rural society transformed into sites of material and symbolic production in new and interesting ways. I will leave it to you to read (if you wish) my embarrassingly idealistic musings, but underneath it was the sense that open education is about an attitude to the role of education in society, and the role of openness in allowing people to access, create and share education materials, of destabilising the sites of knowledge production and consumption, as part of creating a more just and equitable world – and perhaps being open to thinking about our rural communities as sites of innovation and enterprise.